The purpose of this essay assignment is to gain experience in writing about relevant scientific and/or clinical issues in a clear and concise manner. The essay topics require you to explore the recent scientific literature and present a synthesis that reflects current understanding of the relevant issue(s). The key to these essays, and what should make up the bulk of your essay, is a detailed description and discussion of the neuroanatomical and neurophysiological mechanisms that underlie normal function, or are associated with a disease or condition, or relate to clinical therapies (depending on the topic selected). • Essays should be 1500-1600 words in length (word count excludes figure legends and the bibliography, but does include in-text citations). Any text beyond 1600 words will not be marked. • Essays should be typed (not hand-written) in an easily readable font such as Times New Roman or Calibri. • Please use a font size of 12pt and 1.5 line spacing for ease of reading. • Figures may be included (and referenced to the source where appropriate). • All information sources should be cited in the text and a list of these references provided in a bibliography at the very end of the essay. Please included the subtitle Bibliography (as a single word on one line) before your reference list to prevent the references from being picked up by the plagiarism detection software. 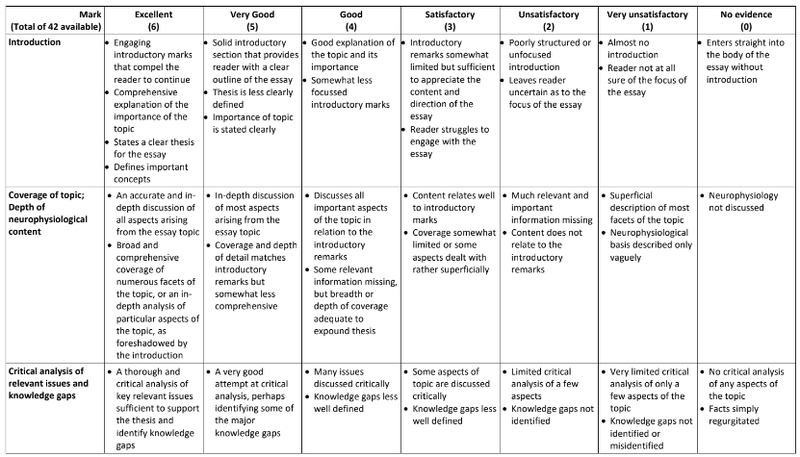 Please follow these guidelines as they will help you to write a better essay and they also relate directly to the rubric used to mark the essays (see below). • Before starting to write your essay, think about the topic and spend some time trying to understand what the topic is about and what information might be required. • The best way to get familiar with your topic of choice is to consult a textbook and/or a journal review article. These sources will give you an overview of the topic and hints on your essay talking points. However, the detail, the material that you should be referencing, should come from the original journal articles. Where appropriate, experimental protocols should be highlighted, i.e. how the researchers got the results that they did. PubMed, Scopus or similar databases through the library. different aspects of the topic. • The main body of the essay should critically discuss the literature and identify knowledge gaps. In this context, ‘critically’ does not necessarily mean finding flaws, rather it means discussing the different viewpoints or evidence that may exist, and where appropriate formulating an opinion or hypothesis based on the scientific evidence. • You should finish the essay with an engaging/stimulating conclusion that summarises your thesis, and identifies avenues for future research and/or therapeutic approaches. • As with all writing, try and tell a good story. Avoid the use of jargon and unnecessary abbreviations (and define those you do use) and make sure each sentence is a clear statement. Avoid rambling. • Use sub-headings to organise the essay into relevant sections where appropriate. • Make proper use of paragraphs to structure your essay. Remember the important literary rule of one idea per paragraph. • Check your spelling, grammar and punctuation. • Please included the subtitle Bibliography (as a single word on one line) after your essay and before your reference list to prevent the references from being picked up by the plagiarism detection software. • Figures are encouraged if they aid in the description of the physiology. • Don’t forget to save and back-up your work frequently, including coping drafts and final versions to a USB stick and/or emailing drafts to yourself. That way there will always be a backup copy, preferably one sitting on a server somewhere, if your laptop dies. The essay assignment is worth 15% of the final mark for the unit. 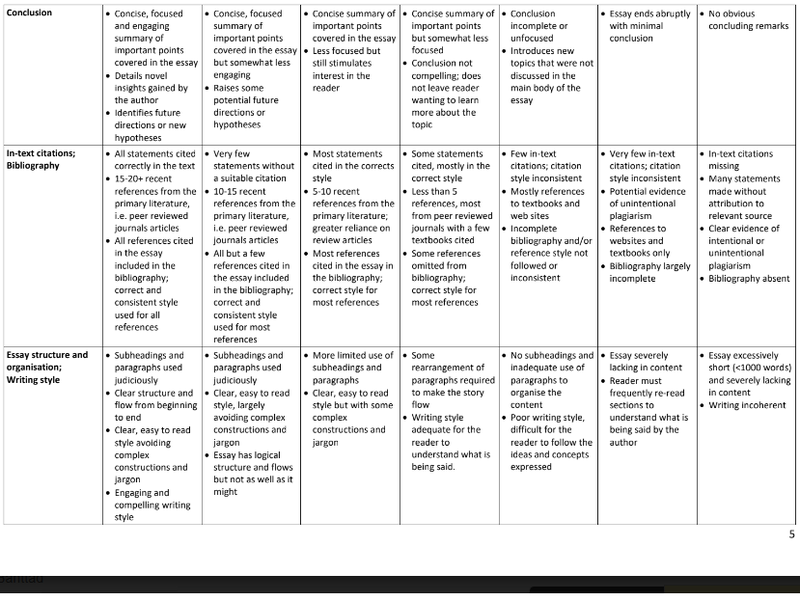 The detailed marking rubric is provided below for your information. • Plagiarism can be deliberate or can happen unintentionally, so you must always think about what you have written and whether it can be interpreted as plagiarism. All assessments are submitted online through iLearn and so will be scanned and assessed for plagiarism using Turnitin software. Any cases of plagiarism will be referred to the Academic Disciplinary Committee as per the relevant Macquarie University Policy. If anyone has any queries, please use the BIOL257 student forum or chat to a tutor.